Proactive people are people that own their destiny. Instead of responding to their circumstances, they take action and influence it. They are responsible for the outcome and is able to adjust and change course and their approach to meet objectives. Succeeding is almost never a solo effort. Success is often dependent on the support one gets. It is obvious to assume that a high achieving community must, therefore, have a larger proportion of high achievers. And a group of high achievers that support each other. Olds in Alberta is fast becoming a beacon of high achievement. Not, because of any particular windfall. It is not a mecca for natural resources, and its location is a little out of the way. You will drive past it on Highway 2 without knowing it is there. Yet, Olds is rising above the rest due to the foresight of four individuals that decided in 2001 to create "capacity" in the town. They dared to dream. Like all dreamers, they dared to ask, "What if? ", and Olds Institute was born. The Olds Institute is a non-profit community and economic development organization. So far it sounds very familiar to other government, or grant funded dark and useless money pits, that purports to be "for business" and "for people." There is one substantial difference though. 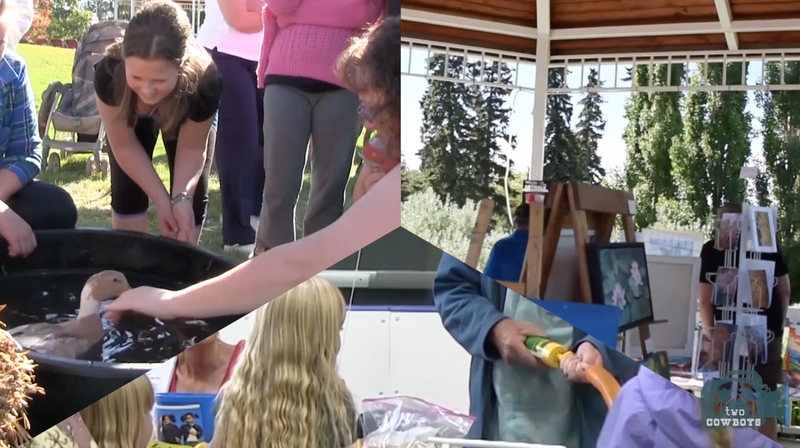 The Olds Institute is different in that it is owned by the community and driven by volunteers. It is not a grant-funded quasi-governmental front for influencing policy to benefit a few "shady" corporate-connected political power brokers. (An all too familiar scenario lately around the public services arena of Alberta). Instead, it is an organization for the people of the community, by the people of the town. Did we hear it right? A pro-business community? The Institute leverages the resources in the community by empowering volunteers to build a community with values for innovation and entrepreneurship. 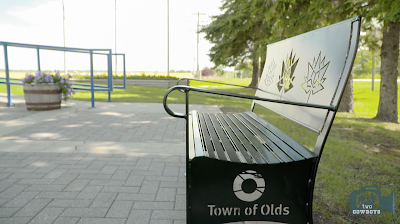 Olds residents have opted to pitch in and support the initiatives that enhance the community and improve their quality of life. One such effort involves the launch of O-NET. 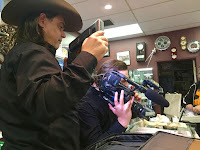 As Canada’s first community-owned and operated Fibre-to-the-Premises network, O-NET brought together and delivered unique broadcasting, phone and Internet services to residential and business customers. 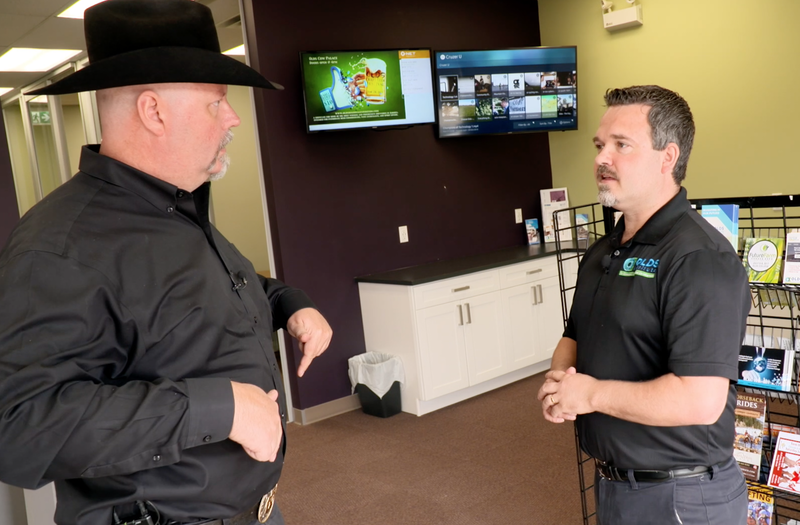 It offers the fastest Internet speeds in the country, the latest high-definition television features, fully customizable telephone systems, mass storage and virtual private networks. Olds' people and businesses have capacity in technology that is the envy of many multi-national companies, and the community owns it and profits from it. 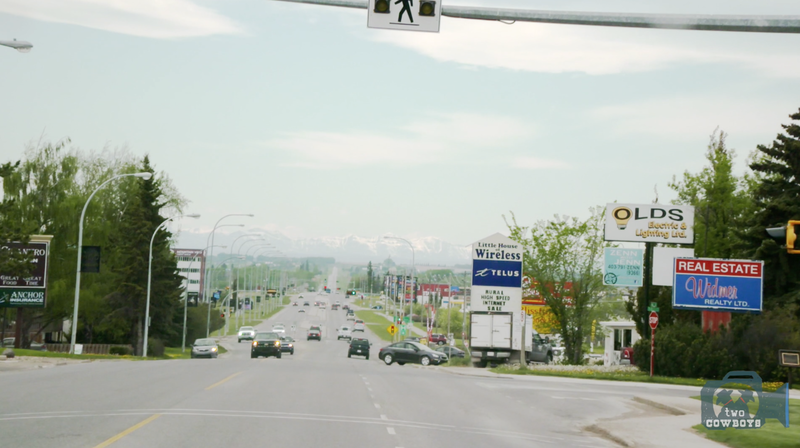 Another is Mountain View Power, which is a local energy retailing business belonging to the Olds Institute (the community), which provides electricity to homes and businesses located in the Central Alberta Mountain View County Region. Again, the profit from this is applied directly back into advancing the community. There are many other examples where the Institute helps to make a difference. The Olds Institute was formed in 2001 by community leaders who realized they could achieve more together than they could apart. It is governed by a board of directors representing the four founding members and the community as a whole. 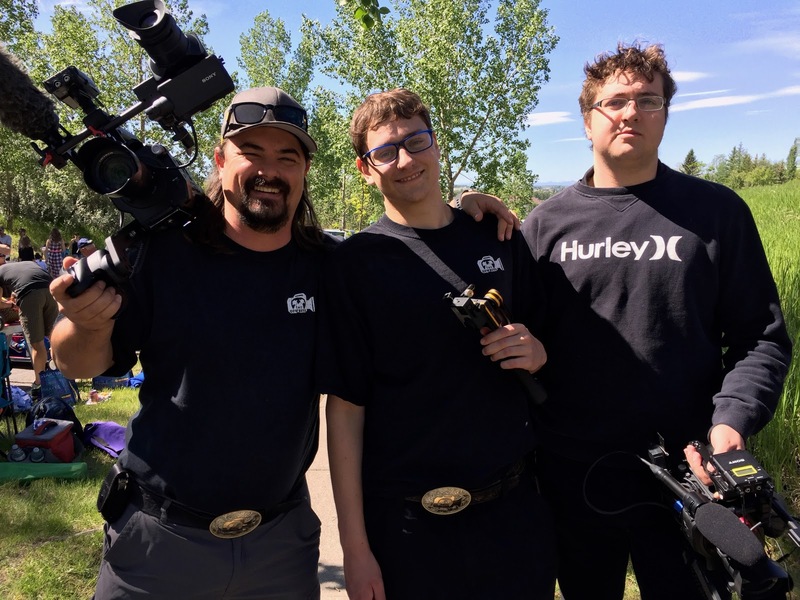 The four founding members were the Olds and District Chamber of Commerce, Olds College, Olds Regional Exhibition and the Town of Olds. The Olds Institute has now expanded to include associate members: Mountain View County, Chinook’s Edge School Division and Red Deer Regional Catholic Schools. We've asked a simple question when we first encountered the story of the Olds Institute. The question was, "Where have our institutions failed, that we need an organization like an Olds Institute? Why do we need yet another initiative to step in for the 'betterment' of the community?" Joe Gustafson, one of the founding board members, cleared it up for us. For Olds, there was a need for stakeholders to find a way to work together so that a larger agenda can be broached. The larger plan is supporting the building of the community's capacity. No single entity was up to the task, and still, no one is. Not the Town Council. Not the Chamber of Commerce. 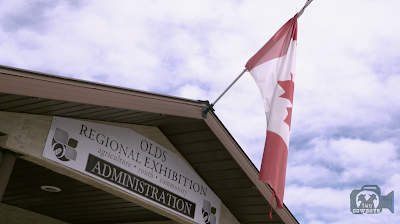 Not the large organizations in town, like the Olds College and Regional Exhibition. There was a need to agree what was best for Olds overall and work together towards simple outcomes that are capacity (infrastructural) focussed. Capacity is represented by skills, knowledge and the ability to find the tools to accomplish goals. The Institute, therefore, supports the sustainability and growth of the business community as a whole, making community development decisions in its favor, and recommendations based on the greater good of the community overall, while respecting the individual outcomes of the Essential Members of the Institute. It is a simple matter of working together on shared goals so that everyone on Olds can benefit. Who Touched Your Life Today? It is sad that we know more about people we are unlikely to ever meet than we do about the people that served us our morning coffee. The tone for our days are set by television, newspapers and social media, by immoral and corrupt politicians, celebrities with paid-for-opinions, leaked emails, the next big tech gadget, the online meme, a cat video, the price of the US Dollar and Aunty Bessie's next inspirational Bible verse. Apparently, if we follow conventional wisdom, we should be concerned about people who know zip about us and is unlikely to ever care who we are. The monkey is amused. We suffer from a media-induced "connectedness fallacy" that is perpetuated by our constant fascination with "important" yet worthless content. Why should we be bothered with the politician's email server? How can it matter what Kardashian had for lunch or who is buying DiCaprio's dinner? Cousin Johnny just bought a new motorcycle. Big deal. The Government just introduced a new tax. Boohoo. Putin just took off his shirt. Really?! We live in an artificially connected algorithmically personalized informational content box driven by classifications, polls, likes and comments from someone somewhere, everywhere. Our real lives are passing us by. Every day, many real people touch our lives. We go through our rituals, work and habits and interactions with human beings not knowing anything about them. Do we know who they are? What are their names? How did it happen that they crossed our path? How do they feel and what do they think about us? Yes, we should. The real people we touch and those that touch us define who we are, where we are, how we act, feel and who we eventually become. It is easy to ignore a message, email or ping. No connection, right? It is not easy to ignore a person that steps through your door, shakes your hand and asks: "How are you doing today, my friend?" These are the people that really matter. Let's go out and meet them. Let's introduce ourselves. Every life is made up of many, many stories. A person begins as part of a parent’s story. It is soon eclipsed by stories of discovery, finding an identity, forming relations, dealing with disappointment, and ultimately discovering or losing their purpose. We are the sum of our stories. Stories unfold from perspectives, intentionally or otherwise. Stories become the distorted shadows in Plato's reality cave, outlining the elusive and enigmatic, while perpetually weaving itself into our identity. This discovery alone distinguishes the few from the many. Knowing that a story is just that. A perspective. The reality is something much more elusive and a lot less interesting. This is the first step to higher understanding. Others become part of our stories as we become part of theirs. Some are positive and others less so. A positive story may be the result of a smile from the person that passes. A negative story the upset because of a smiling passing stranger. While we are part of other’s stories, discovering that we can only influence our own, is considered by many as the second step to higher understanding. No amount of positive intent can account for someone else’s perceived tragedy. We are held accountable only by what we choose to include in our own experience and thought. Because it is what we include that we will perceive and ultimately receive. It is what makes us, us. Intentionally writing one’s own life’s story is the third step to higher understanding. The question that remains is: If we can only write our own story, why then do we default to doing so for others? What more have we to give one another than our limited version of the truth? It is our story about our human adventure as honestly and as openly as we know how, that we share. In sharing, we hope to be recognised to become part of the stories of others. In sharing our stories and that of others, we become intertwined. They become part of us, and we become part of them. This is the fourth and final step to higher understanding. We are connected. Let it then be good stories we tell. The Two Cowboys' mission is to learn, inspire and showcase small Producers all over the world - the people that make things. 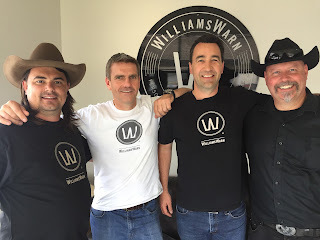 We do it with videos, blog posts, photos and through social media. While undertaking our journey we travel a lot and interact with many people in local communities. When we interact with someone or reach out to a person, they become part of our story. We influence each others' lives. 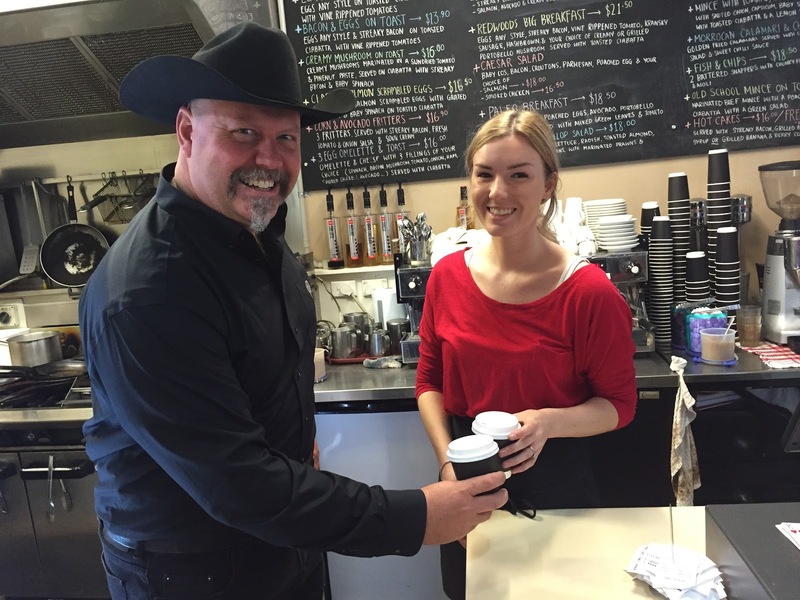 The people we feature serve us our coffee, brew us our beer, sew our shirts, mould our hats, service our trucks, grill our steaks and much more. They are cashiers, servers, assistants, workers, donors, sponsors and entrepreneurs. These are people in who we are vested. We are connecting with them. We believe that we have a duty to introduce them to you, our audience. We want the world to know who they are. We want you to know them, meet them, and support them. We will post photos of them on our Facebook Page and Instagram Feed. When you think Canada, you yearn for cozy winter nights in front of a fireplace and softly falling snow outside the window. Inevitably, your mind's eye wanders to all that is familiar about Canadian winters. The smell of apple cider, pie in the oven, and the snug feeling of soft flannel against your skin. You know you are home. 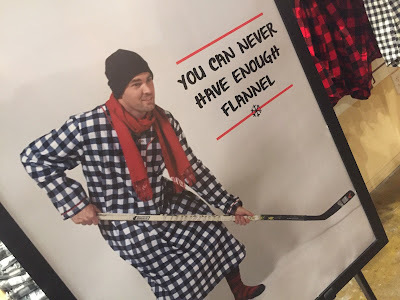 Flannel is as Canadian as the word "eh". It is as authentic as your granny's smile. What is flannel? It is a soft woven fabric. Flannel was originally made from carded wool or worsted yarn but is now often made from either wool, cotton, or synthetic fiber. Flannel may be brushed to create extra softness (which makes it ideal for keeping warm) or remain unbrushed. Brushing is a mechanical process wherein a fine metal brush rubs the fabric to raise fine fibers from the loosely spun yarns to form a nap. Typically, flannel has a nap on either one side or both sides. If the flannel is not napped, it gains its softness through the loosely spun yarn in its woven form. 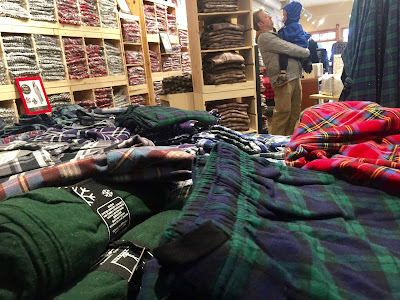 Flannel is commonly used to make tartan clothing, blankets, bed sheets, and sleepwear. The term "flannel shirt" is often used to mean any shirt with a plaid or tartan pattern. Flannel's origins can be traced back to 17th century Wales where farmers wore flannel shirts to protect themselves from the elements. 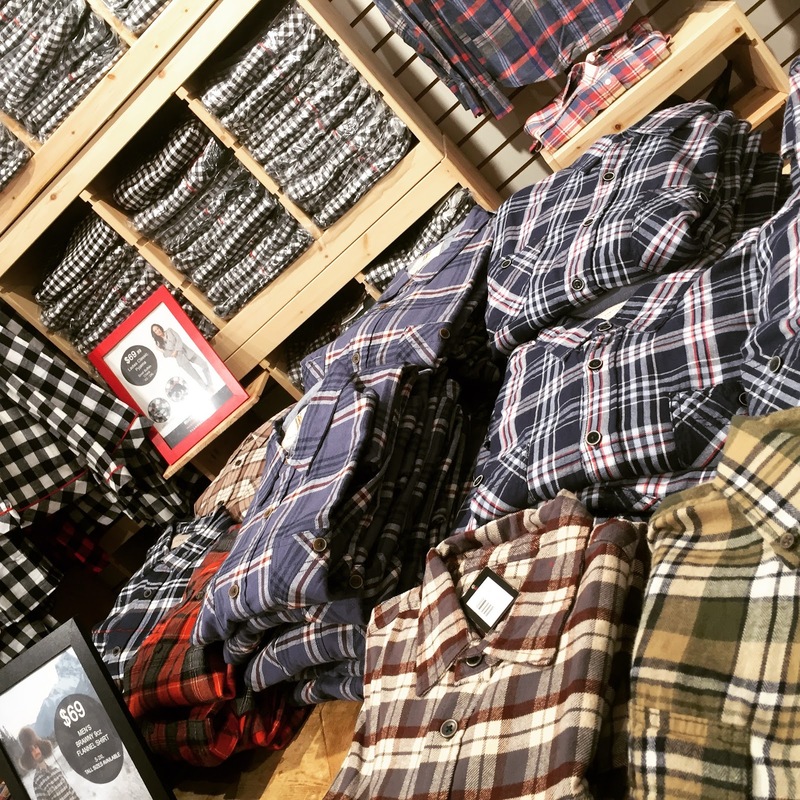 This tradition would continue for other blue collar workers as the prevalence of flannel grew. 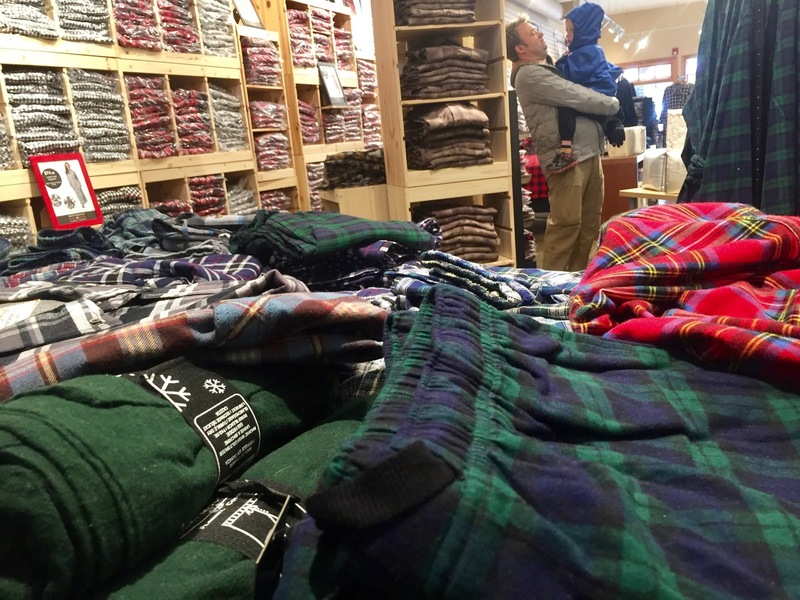 The word "flannel" most likely comes from the Welsh word gwlanen, meaning "woolen article." Not many people know that the Bow Valley in the Rocky Mountains of Alberta has its very own flannel garment company. Gayle Houlton is the founder of Rocky Mountain Flannel. It is a business with a history that spans almost three decades. 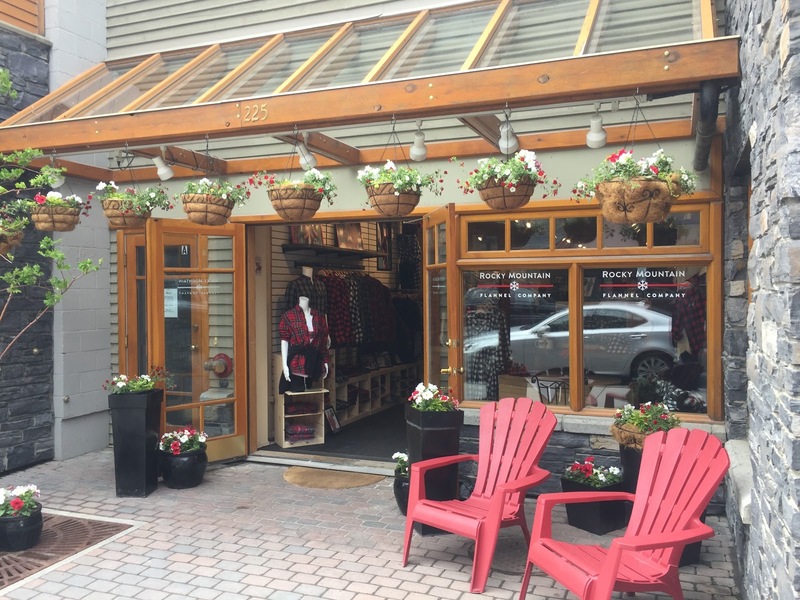 Her background in pattern making and design, and her extensive experience in retailing helped Gail to create a thriving little apparel jewel with a beautiful store that she recently relocated from Canmore to Banff. 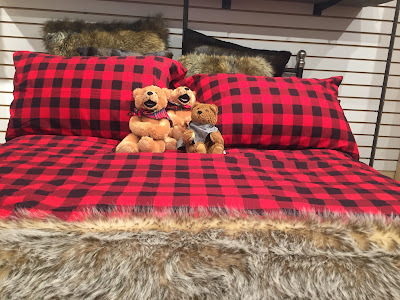 Rocky Mountain Flannel Company has flannel pajamas, nightgowns, pants and shirts and deliciously warm flannel bed sheets. Every product is researched and tested for quality, fit, wear and tear. In exchange for good honest feedback, Gayle often gives a new item to friends and family to try out and review. “Believe me, they are honest!” It is like dressing your children, she shares with us. They will tell you exactly what they like and dislike. Garment manufacturing is not a kind of business you associate with the prairies and mountains of Canada. On the other hand, garment design, retailing and distribution are again growing in popularity. 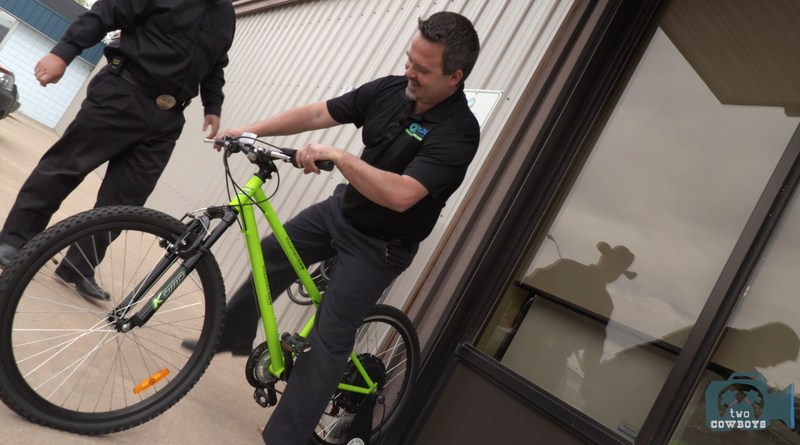 Enterprising designers are taking advantage of flexible sourcing opportunities. It allows them to address the localized needs of a discerning and increasingly demanding clientele. Good quality fabrics can easily be sourced from all over the world. Combine this with cost effective small batch manufacturing, and it opens up opportunities for designers to craft unique items for their local markets. Clients are turning away from uniform, poor quality, lookalike, and almost disposal clothing articles in discount stores, according to Gayle. They are shifting towards higher quality, locally sourced, better designed and more comfortable fitted garments. Call it the hipster movement if you like, and call it out for its non-conformist flannel wearing patrons. 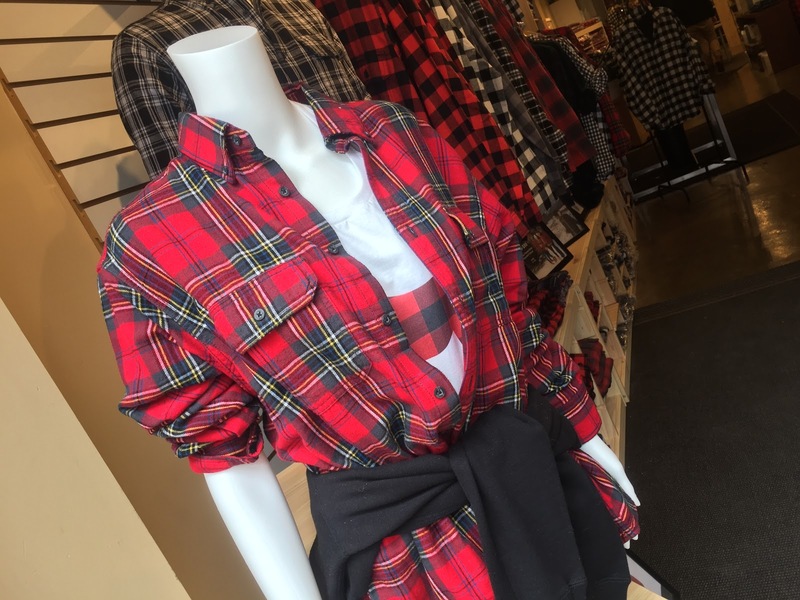 As far as we are concerned, wearing flannel is about being Canadian. 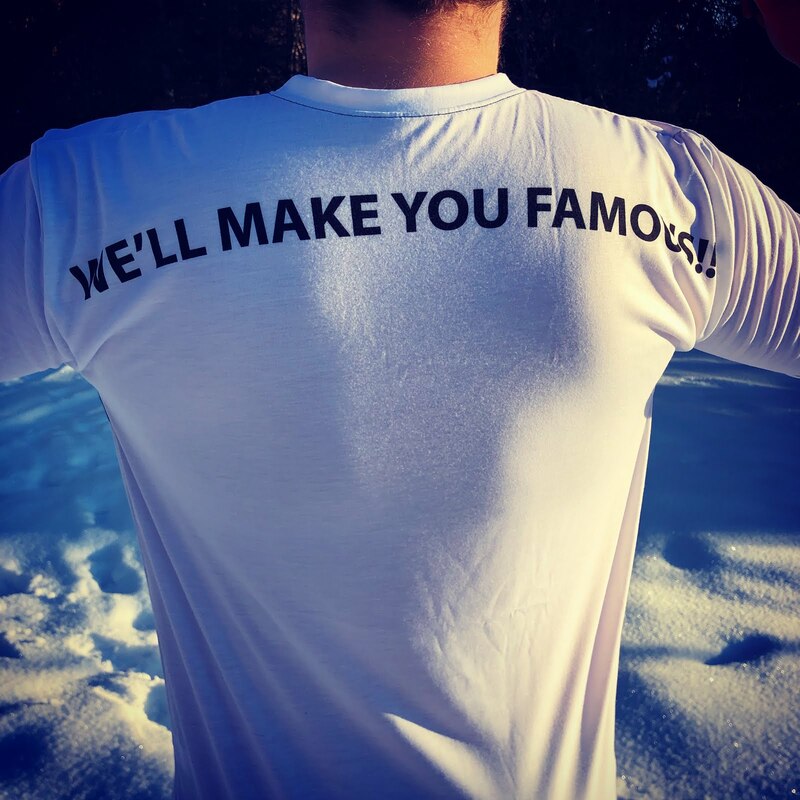 It is also about supporting Gayle to make us our favorite shirts we proudly wear because they are nice! 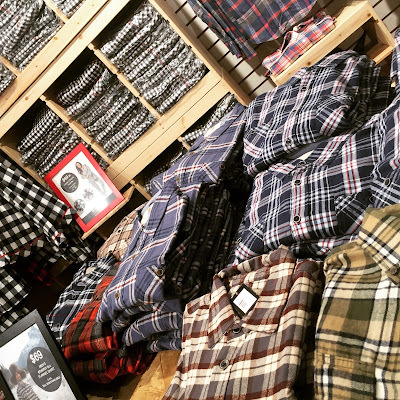 We like wearing our Rocky Mountain Flannel shirts, especially when it is cold outside. We checked in at the annual Okotoks Soap Box Derby to see how a community came together to build something, compete, race downhill, fall off, crash, repair, get back up, win (or lose) and have fun doing it all on a Saturday in early Summer 2017, and doing it for a good cause. I know what you are thinking. "You must be joking!" There are so many contradictions in the sentence above that it is unbelievable how an organization can still pull it off in today's world, let alone get away with it for almost three decades in a small Alberta town going by the name of Okotoks. Where do kids still build things with Dad, Grandpa, Uncle or Aunty? Surely, they can buy one at Walmart or a super duper one at Costco? 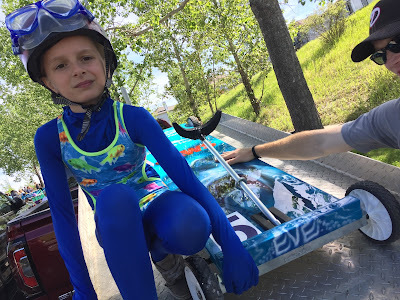 Why on earth are kids encouraged to compete? In today's world, there should be no need to compete. Resources should be shared and redistributed equally, so everyone gets a chance. Doing something as dangerous as racing down a street at 35+ km/h is totally irresponsible. Doing it with sneakers, costumes or short pants, and only a helmet for protection is negligence on the parents' part. Someone should do something! Is there no bylaw or regulation that can stop it? And then there is the "uber-evil" of declaring somebody a winner. How dare they! Think of the emotional trauma of all the losers and the future medical expenditure for dealing with ongoing depression and the resulting low self-esteem. 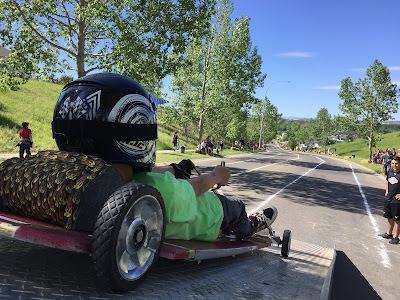 We are so glad that there is a Soap Box Derby in Okotoks. This is the world in which we want to live. We want to be in a world where people are encouraged to make things. Where kids work with family and friends and innovate to compete, learn, adjust and win. The world, where calculated risk-taking is encouraged, and winners are celebrated. We love being part of a community where people come together to build things, compete, win (or lose), learn, celebrate and support each other. The event is open to youth ages 8-14. 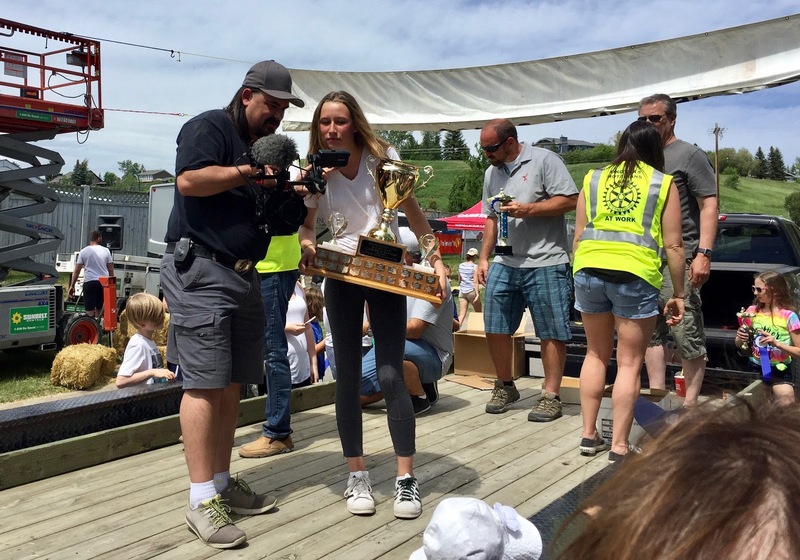 A part of the entry fees is donated to a charitable cause in the town. 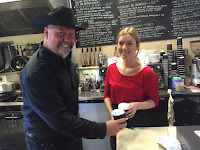 Local businesses like Carstar Okotoks stepped in with matching donations. 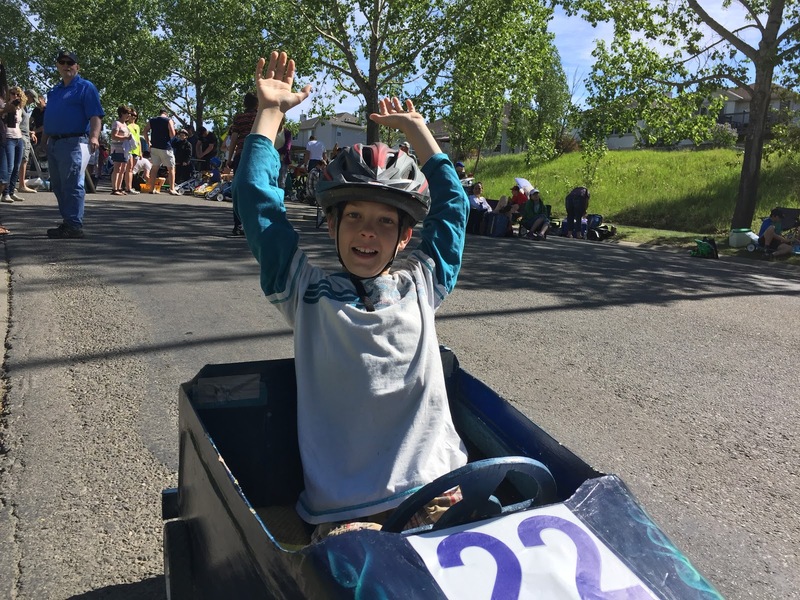 According to Mark Kharfan, the organizer, soap box car kits are available for purchase to keep the baseline fair between competitor. The package typically consists of the standard soap box derby cart and all the instructions that come with it. There are wheels, the mechanisms, the steering, and a four by four sheet of plywood. Cars are made with a lot of creativity and ingenuity to get them faster down the hill. The trick is in aerodynamics, weight reduction, and lubrication. For others, it is all about the style of arriving at the finishing line. Usually, there are between 85 to 120 participants. This year didn't disappoint. We were lucky with the amazing weather for the event. No one was seriously injured, and everyone seemed to be having a lot of fun. The organization and orchestration of the races ran like a well-oiled machine. 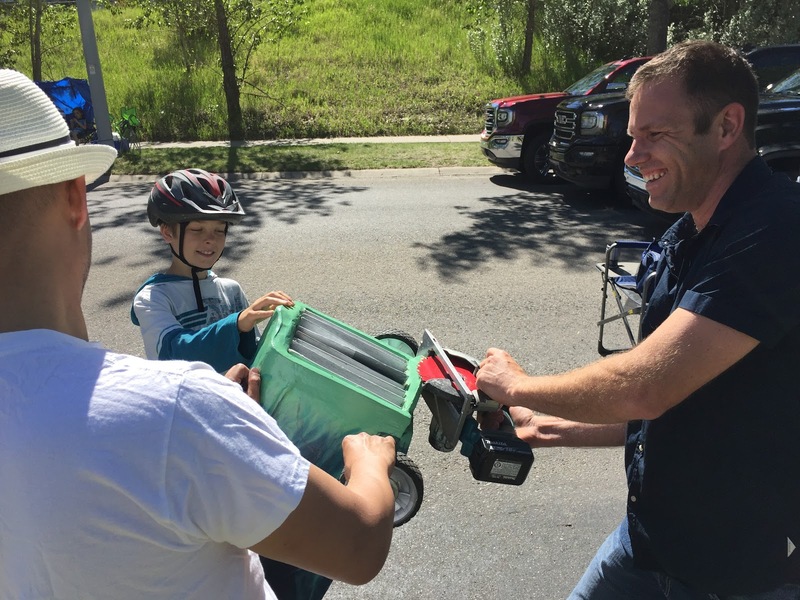 Okotoks is an amazing community. We are glad we could share the day with them. We are pleased that old-school values are still part of their world, and ours. We earn our livelihood from producing great content about inspiring people, businesses, and communities. We use Patreon to help us earn from our work. Please become a patron at http://www.travelingcowboys.com if you want to see more of this and other stories. Alberta has its own Brigadoon. You will find it at Waterton Lakes National Park on the southern border of the Province. It is called Waterton Village. Like its counterpart in the Brigadoon story, the Village wakes up every 8 months, instead of every 100 years, to be the setting for a microcosm of activity. When the snow arrives in October it is shuttered again, only to reappear in late Spring the next year. In this little community, a unique group of people, from all over the world undertakes an annual pilgrimage to spend four sunny (and often windy) months together. A place where they come to celebrate their short Canadian summer. In Waterton, teenagers start their first jobs, children take over family businesses, and the ones that retire, come to say goodbye. It is a very special place because of its natural beauty. It is magical, because of its people. 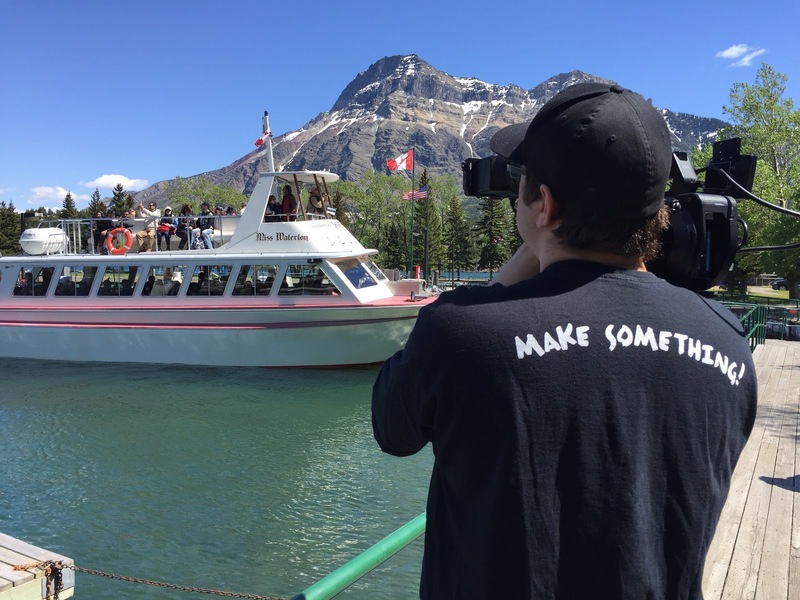 This is the first of a three-part installment about Waterton in 2017, courtesy of the Waterton Park Chamber of Commerce, Chinook Country Tourism and Travel Alberta. 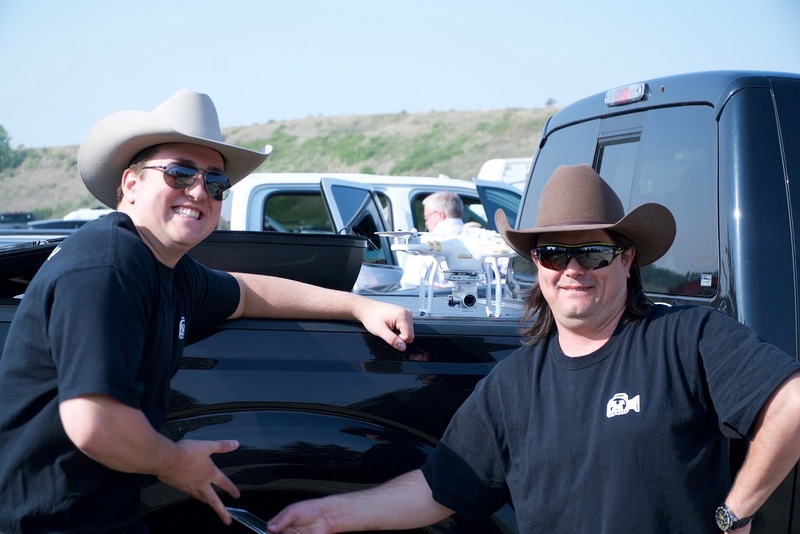 The Two Cowboys feature the season's opening with the Waterton Food Festival. Our schedule was set with the Friday night kick-off of the festival at the Thirsty Bear Socialhouse. It is a newly renovated part of the Bayshore Inn on the waterfront. Shameer, the owner, explained that it took them a whole year to decide what should make it onto the upmarket pub-style menu. 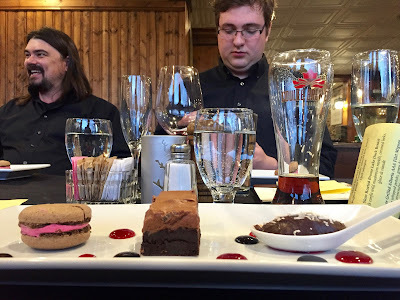 The food was delicious, and the Truffle Mac & Cheese was divine! 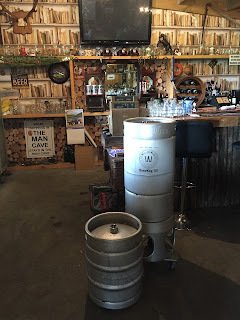 Everything in the establishment is brand spanking new, except for the reclaimed wood of the bar and the solid timber beams that still exhibits the cattle branding marks of the old Saloon. The kick-off delivered tasty samples from the festival's participating food businesses. Business such as the Taco Bar, Wieners of Waterton, Zum's Eatery and others were well represented. The local brewery, Coulee Brewing Company from Lethbridge, was also on hand to deliver tiny tasting servings of their popular beers. The food was just enough to entice us to visit the restaurants individually during the festival week that followed. It took a good solid morning of recovery from the night before, to be ready for the Pie Cruise with the Waterton Shoreline Cruise Company. 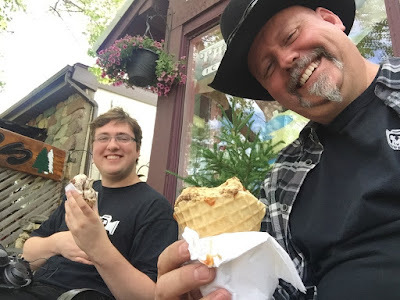 Participating businesses contribute two unique pies each to the excursion and try to out-do each other with pie creativity. The pies were served to patrons on the scenic boat ride that took us to the border with Montana (and back, of course). The favorite was the Chocolate Moose Pie from the newly opened Larkspur Coffee House. We were told that it took two full days to layer the amazing creation. Pie is apparently a Waterton thing! 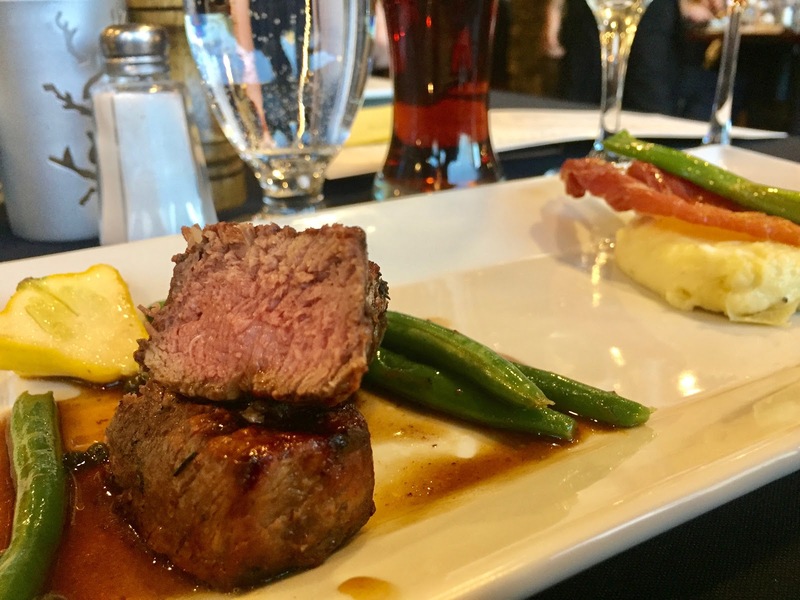 The rest of the festival included a chef's dinner and special set menus at the various food establishments. We can continue to list the festival's experiences, but it won't do it justice. Instead, watch our video about the event. It is the second time we covered the festival. 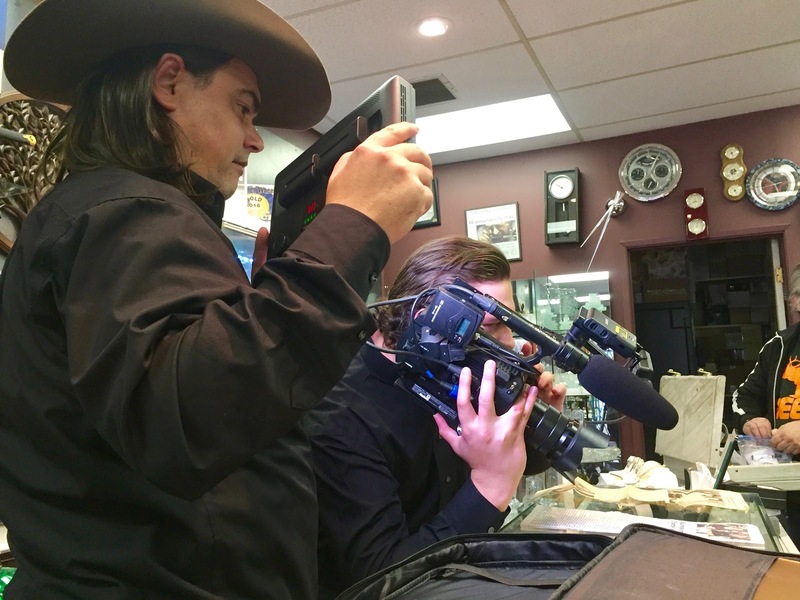 It is growing into an annual feature for Waterton and for the Two Cowboys. You had to be there to appreciate what was on offer. Waterton Village is not the gourmet capital of the Rockies, and it doesn't try to be. 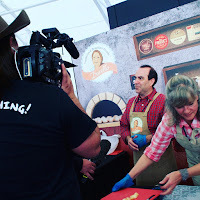 It is rather a unique group of people with a lot of creativity and a passion for food and their village. 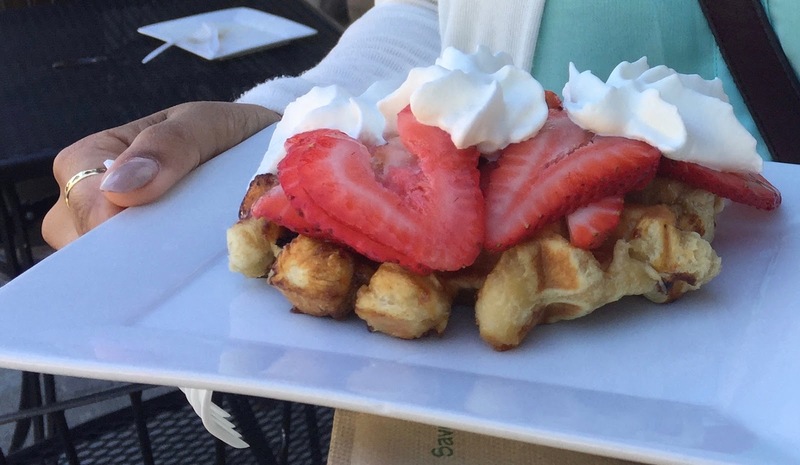 They bring something fresh and new each year to serve to visitors. All businesses are family owned and operated. Many are run by second and third generations. As a tourist, you can drive through Waterton in a few minutes and miss most of what it has to offer. If you decide to stay for a short while, the local folks will go out of their way to get to know you. It can get very busy at times so prepare for standing in line. Be warned. 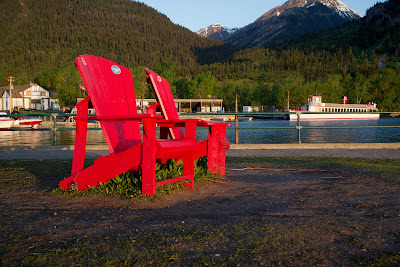 Waterton Village and its people have a welcoming way to pull you in and make you part of their world. Soon you will be one of them and also make the annual pilgrimage to Waterton's Food Festival. 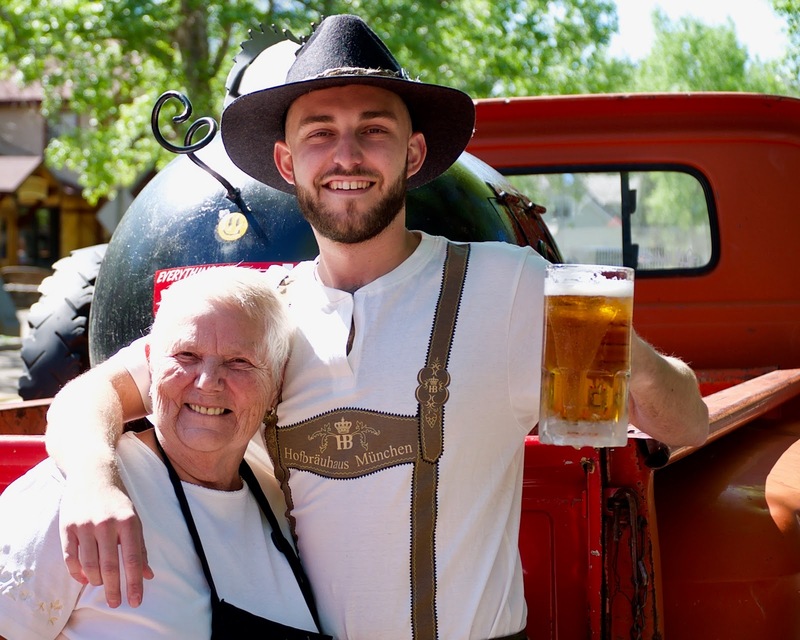 Before long, you may become part of the family in Alberta's own Brigadoon.